The Grand Union Canal weaves its way along the northern and eastern fringes of Milton Keynes from Cosgrove in the north to Fenny Stratford in the south. The Grand Union Canal passes within a five minute walk of Leighton Buzzard High Street and train station, yet feels like a world away. 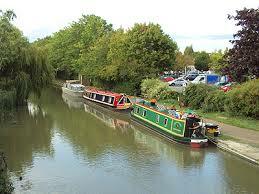 Grand Union Canal passing through the Leighton Buzzard city centre.